And of course, July 4, 1939, was Lou Gehrig Appreciation Day, which made me realize that the Yankees have been home on the Fourth a lot in recent years (before this year’s trip to Cleveland, they were in the Bronx the previous four years). And then I wondered how they’ve done on Independence Day since Gehrig Day. And so here it is: Beginning with the 1939 doubleheader, when they honored Gehrig between games, the Yankees are 52-42-1 when playing on July 4. That stretch includes 26 doubleheaders (the last of which came in 1973, a sweep in the Bronx by the Red Sox) and three idle days — two when the Yankees were rained out (1978 in Boston and 1941 at home — more on that one a little later in this post) and the 1981 strike year. At Yankee Stadia, the Bronx Bombers are 32-23; on the road, they’re 20-19-1, the tie coming in the second game of a twin bill in 1950. The first game went into extra innings and the second was called because of darkness. That amounts to 55 July 4 games at home and 40 on the road, before this year. Sixteen of the doubleheaders (17, counting the 1941 rainout) were scheduled for Yankee Stadium; 10 (11 counting the Fenway washout) were on the road. So the Yankees have been home on July 4 more often than not. Now looking at just 1973-2010, the years Steinbrenner owned the club before his death last July 13, the Yankees went 21-16 on the owner’s birthday (they were rained out on the Fourth in 1978 and the strike kept them off the field in ’81; in ’73, they lost a doubleheader to the Red Sox), playing 22 games at home and 15 on the road and outscoring opponents by a hair, 163-160. Rough estimates placed the loss of yesterday’s washouts as close to $125,000 for the local clubs. A PDF of the full article is here. All of this came about as I was perusing various schedules to see if there was an Independence Day matinee I could take in before working tonight. July 4 just calls for a ballgame under the sun, followed by an evening barbecue in the backyard or taking a lawn chair or blanket down to the local park for the fireworks display. And while MLB has a full slate of 15 games today — a pleasant sight, considering that Mondays are often off-days for some clubs — seven (so, nearly half) have the first pitches scheduled for the afternoon. The rest are nighttime affairs — including Yankees at Indians (sold out, in part because of a Bob Feller celebration and statuette giveaway) and Mets at Dodgers. Of those eight night games, only the Cardinals — who have first pitch scheduled for 5:15 p.m. local time — do not have postgame fireworks. 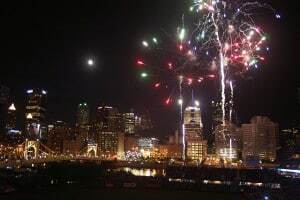 The Cards’ earlier start time must be designed to allow for fans to stay until the end of the ballgame, then catch the 9:15 fireworks at Fair St. Louis under the Gateway Arch. That sounds like a sweet deal to me. As for the local minor league clubs at home today, all will play tonight. The Lakewood BlueClaws, Staten Island Yankees (who are hosting the Brooklyn Cyclones) and Scranton/Wilkes-Barre Yankees (hosting the Lehigh Valley IronPigs) will all set off fireworks after their ballgames. And who can blame them? Fireworks shows consistently draw huge crowds to minor league parks, no matter the date. Obviously, combining an evening at the ballpark with a postgame fireworks show brings the two together. But I personally prefer a town park or waterfront setting for my ooohing and aaahing. To me, it’s not quite the same watching from a fixed seat in Section 21 instead of amid the crowd on a park lawn or along the wharf.